The second of our pool facing doubles, the layout of this accommodation gives it a more spacious feel although they are exactly the same size (We’ve checked, twice!). It too features a window overlooking the pool; enticing you to step into the cool waters whilst enjoying the full unobstructed view that our hotel has to offer. And what a view! 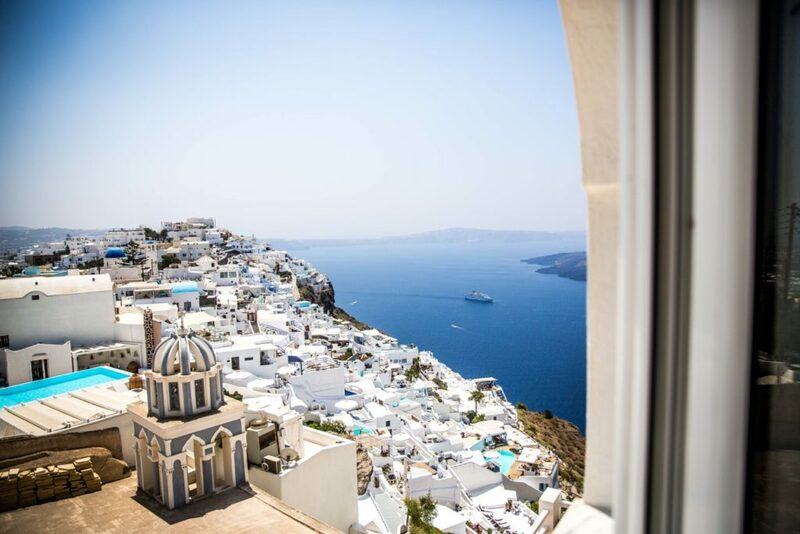 It spans all the way across the Island of Santorini and includes the Caldera Gulf, volcano, Firostefani village, Akrotiri and Thirasia Island. The accommodation has the added flexibility of either a double or twin beds and includes a private bathroom with shower. In addition, there is a refrigerator and other modern amenities – a full list of the features can be found on the Features tab. Hello! I have a booking at your beautiful hotel. I got your email to check the room name/facility provided for my booking through an online travel agency. Since I’m traveling with my wife for the honeymoon, I request you to provide the best possible room for the price paid. Eagerly waiting to visit Santorini. Thank you. Cheers! we are happy that you choose Villa Ilias for such an important occasion!